First Choice Pharmacy is a full-scale long term care pharmacy that provides services to patients who live in group homes, ALFs and retirement communities in Palatka and other surrounding areas. Our staff is here to help you in personalized billing and quarterly in home reviews. Our successful platform and dedicated staff will keep your facility running smoothly. 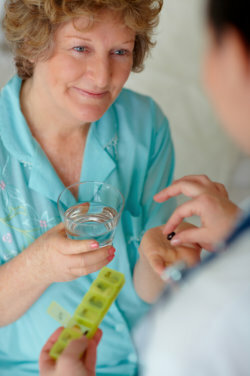 Our pharmacist is a board certified consultant pharmacist who is specialized in senior care medication. First Choice Pharmacy also assists our clients with meeting all state and federal compliance standards. First Choice Pharmacy has an onsite compounding lab. Our pharmacy can receive a script from the doctor for a compounded medication that is specific to each patient and can formulate that medication to fit precise criteria. First Choice Pharmacy provides Smart Bubble Packaging that makes it easy for patients and caregivers to manage their drug regimens which helps to prevent medication errors. Medications are sealed in organized bubble packs that correspond with days on the week and month. First Choice Pharmacy strives to provide the highest levels of customer service and satisfaction. To learn more about how we can help you better serve the pharmacy needs of your residents, call for a free business analysis at 386-219-1988 or send us a message online.